Hemel Town manager Dean Brennan is challenging his players to be braver on the ball against Basingstoke on Saturday as the Tudors look to put a disappointing bank holiday weekend behind them. 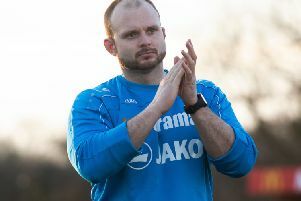 Brennan was furious with his players after they could only draw 2-2 against ten-man St Albans City on Monday, following a 1-0 home defeat to Maidenhead United two days earlier. I know we didn’t give the supporters a lot to cheer about against St Albans, but I think over the last few years we’ve given them plenty to cheer about. However, he is adamant that his players know that much more is expected from them when they face winless Basingstoke at Vaxhall Road on Saturday. “The players know when they have played well and when they haven’t – we have got a very honest bunch of lads,” he said. “One thing that we did do against St Albans was show good character and good togetherness to not get beaten. I was just a little bit frustrated that we didn’t play to our philosophy and how we like to move the ball. Despite Basingstoke having picked up just three points from their opening seven National League South fixtures of the campaign, Brennan is expecting a tough match on Saturday. He said: “Basingstoke are a very, very tough side who finished third last season with pretty much the same squad that they have got now. They’ve got a lot of experience in their squad, a lot of ability, and four fantastic centre-forwards for this level. Brennan has also urged the Hemel fans to get behind the team against Basingstoke, and is promising a much improved showing from the one that his side produced at Clarence Park. “I know we didn’t give the supporters a lot to cheer about against St Albans, but I think over the last few years we’ve given them plenty to cheer about. When the times are tough we’ve all got to stick together,” he said. Brennan does, however, admit that continuing injury problems are leaving him with very few options in terms of team selection. He continued: “I’d like to be able to change things and have a bit more ammunition from the bench, but we just don’t have the players available at this moment in time. “Players are playing out of position, and they are trying their best – I can’t knock their work ethic, but at times I can knock their bravery. “It’s square pegs in round holes at the moment – I can’t make the changes I’d like to at the moment because we just don’t have the personnel fit. But we’ve got a couple of behind-closed-doors games lined up next week and that will give some of the players who need minutes a chance to get them. Matt Spring and Xavi Comas both miss Saturday’s game due to family commitments, while Dennis Oli is unavailable because of a hamstring injury. Mo Shariff won’t be available, and John Frendo and Ed Asafu-Adjay are not yet match fit but could feature from the bench.